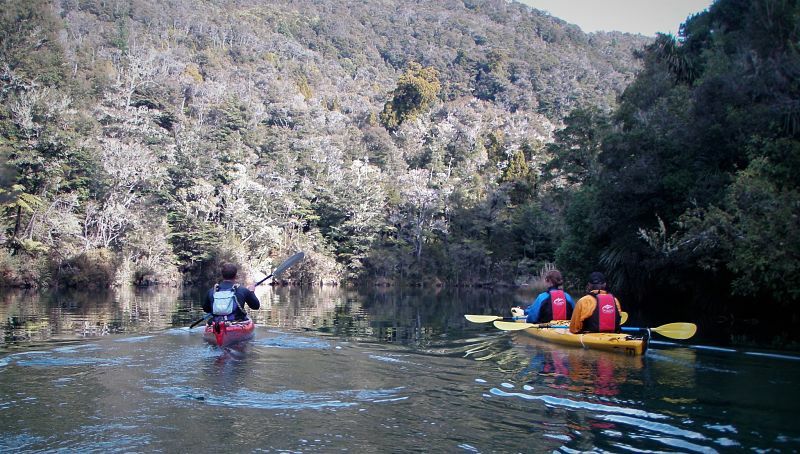 A unique family friendly multisport adventure travel journey through three stunning National Parks with widely varied landscapes, including golden sand beaches, remote and rugged mountains and wild coastline – Richmond Forest Park, Abel Tasman National Park and Kahurangi National Park in the South Island of New Zealand. Enjoy five superb fully guided adventure activities in a continuous journey – helibiking (or cycling), sailing, sea kayaking, helihiking, and helirafting, all of which can be tailored to your fitness and preferences. The journey can be customised to between 2 and 7 days. 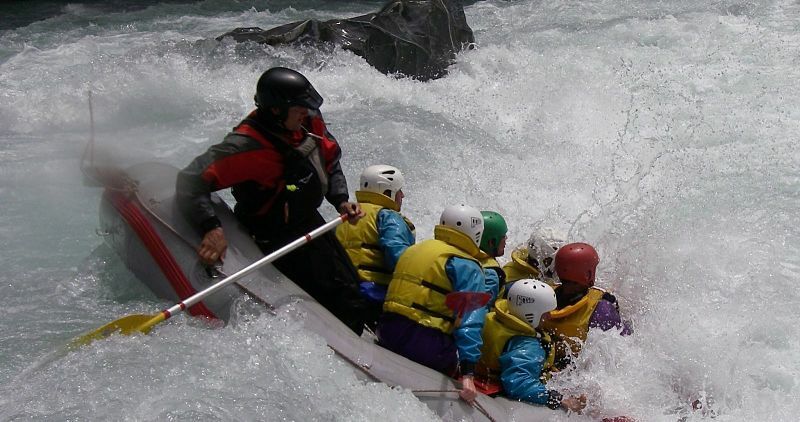 One of the best multi-activity adventure trips in the world, (if not the best!) 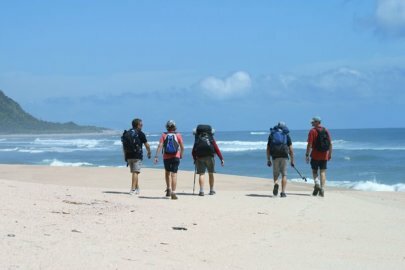 this unique and memorable, fully guided, continuous 4 day adventure Journey, is ideal as a “once in a lifetime” holiday vacation and shared experience for active families, small groups of friends, or small corporate groups. The Journey travels across the wonderful and varied landscapes of Richmond Forest Park, Abel Tasman National Park and Kahurangi National Park, in the northwestern corner of the South Island of New Zealand, through a stunning scenery of sweeping golden beaches, turquoise seas, superb native bush, imposing mountain ranges, wilderness rivers and the remote and spectacular coastline of the Heaphy Track. Two to three nights are spent in lodges and one aboard our 50 ft yacht “Simply Wild”. 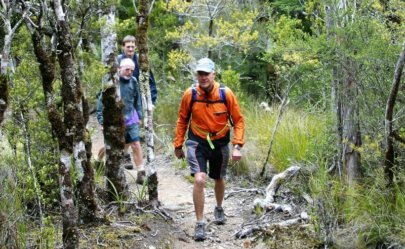 The trip can be tailored to your preferences, with the days becoming harder/longer or easier/shorter to suit your fitness and sense of adventure, and you can make your Journey 2 days, 3 days, the classic 4 or even 7 days by deleting or adding days. After we collect you from your accommodation in Nelson, you’ll head into the wilderness behind Nelson City to meet the helicopter which will fly you to 1000 metres at Dun Saddle in Mt Richmond Forest Park behind Nelson City. 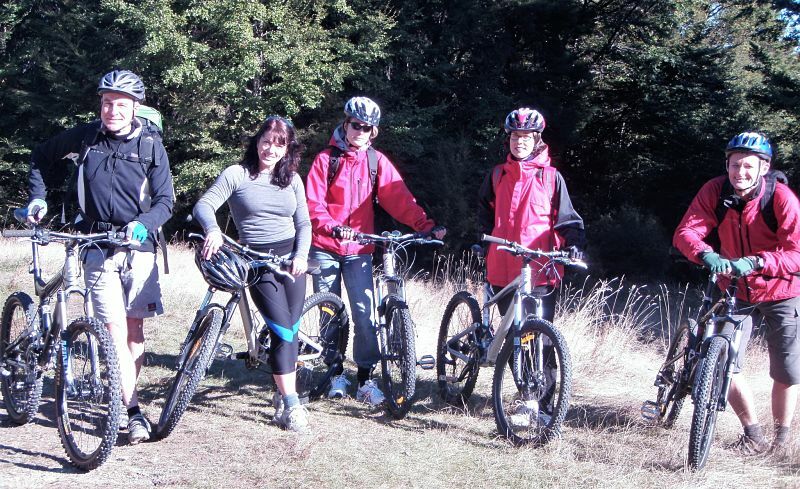 While enjoying stunning views of the top of the South Island, you’ll walk for half an hour on a rocky trail to collect your mountain bikes at Coppermine Saddle for the exhilarating 15 kilometre downhill ride through native bush on the Dun Mountain Trail, a classic ride, now part of the National Cycle Trail Network, which follows the route of New Zealand’s first railway, built to service a mountain mine in 1860. 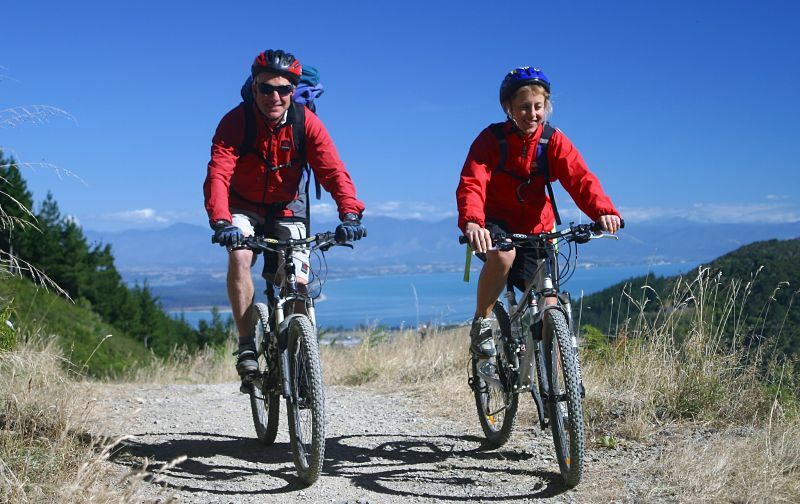 Descending through open alpine country, then beautiful native forest, you will ride back to Nelson City. We’ll have decided earlier with you whether you board our expedition yacht “Sabatayn” in Nelson at midday and sail across to Abel Tasman National Park, or cycle some more on two interesting sections of Nelson’s Great Taste Trail, and join the yacht at the seaside village of Kaiteriteri. An alternative if you prefer cycling on easier trails, rather than mountain biking, is to just cycle on Nelson regions new “Great Taste Trail” before joining the yacht at Kaiteriteri. 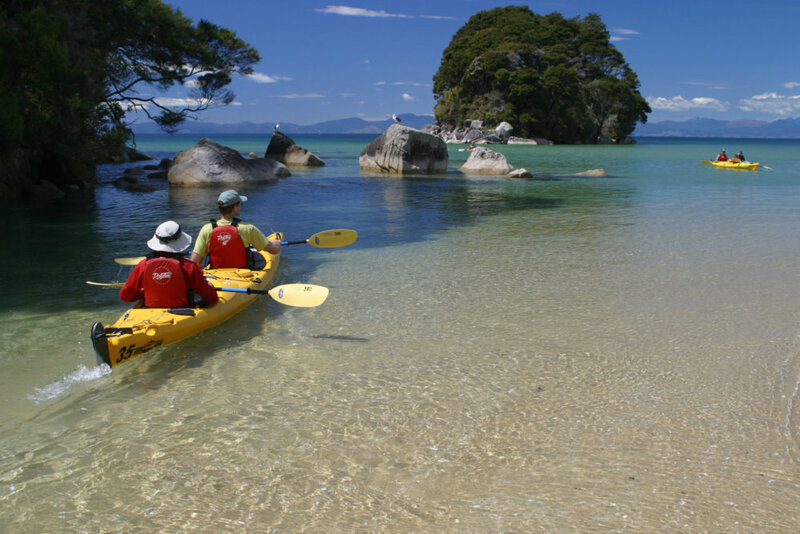 You can relax or get involved in sailing the yacht (depending on the wind) to beautiful Anchorage bay in Abel Tasman National Park, where you spend the night on the yacht. You can swim or walk on the lovely golden sand beach before enjoying dinner prepared by our chef. Today you explore of the famous Abel Tasman coastline in sea kayaks , one of the best sea kayak destinations in the world. You’ll enjoy paddling along the rocky coastline, with it’s golden beaches, tranquil inlets and native bush, before making your way to Awaroa Eco Lodge at Awaroa in the National Park where you will spend the night. 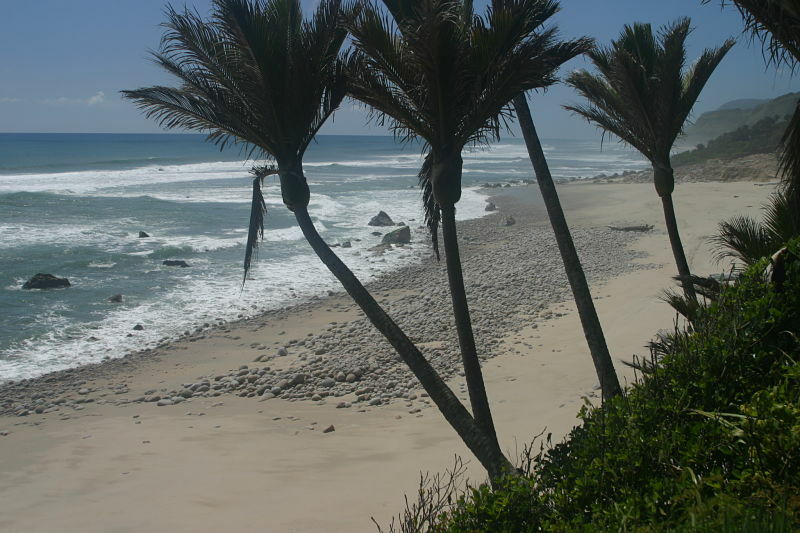 You will be paddling for 3 – 4 hours, with time to stop and swim or just enjoy the stunning beaches and bays. After breakfast you board our helicopter for a scenic trip through the heart of the one million acre Kahurangi National Park, New Zealand’s second largest. Flying alongside jagged peaks, you’ll land on a broad ridge high in the park, then beautiful, glacial Boulder Lake at 3000ft, before descending to the Heaphy River near the Tasman Sea, where you’ll walk the last day of the famous Heaphy Track, one of New Zealand’s Great Walks, through luxurious subtropical rainforest. 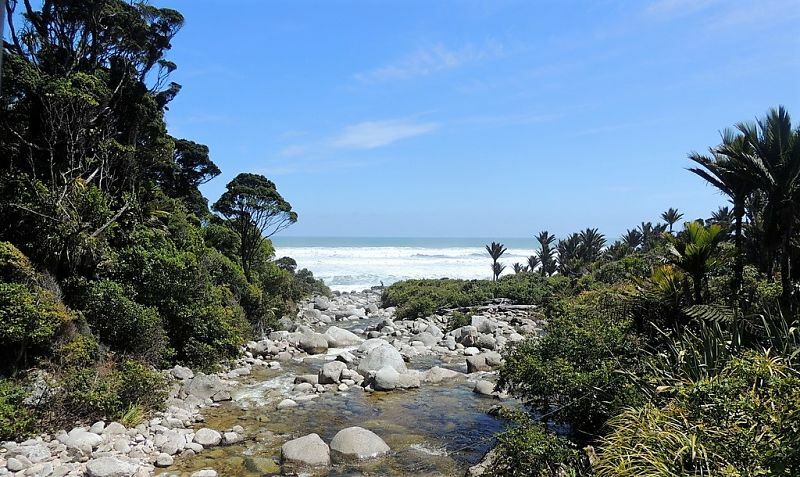 It’s a 5 – 6 hour walk along the stunning, rugged and remote western coastline to the end of the track at Kohaihai and the small isolated village of Karamea, where we’ll spend the night. 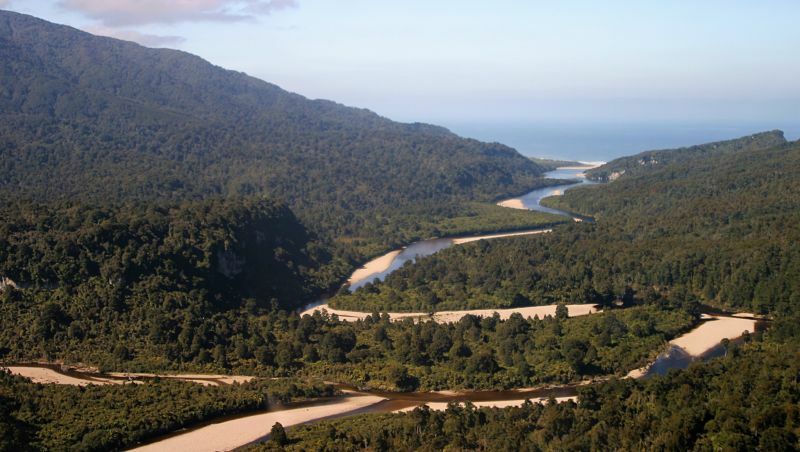 We start the day with a short helicopter trip into the Karamea River. 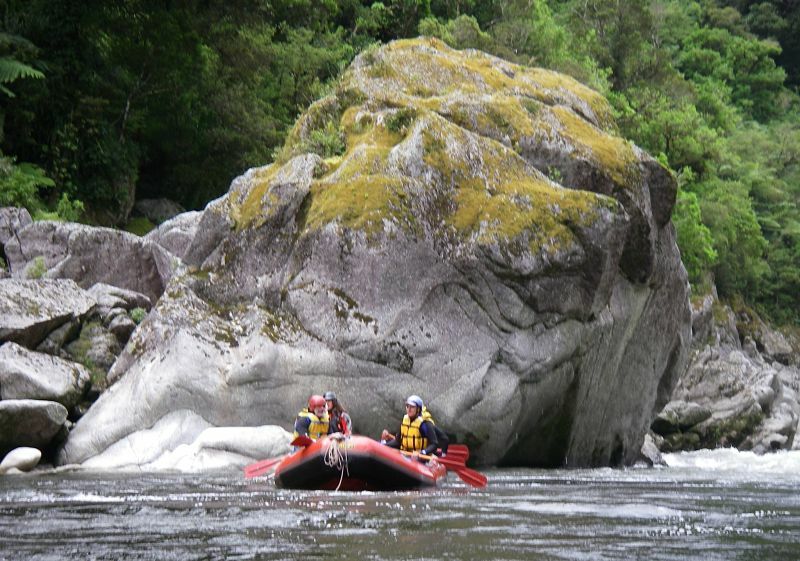 Known as one of the world’s great wilderness multi-day rafting trips, we raft the last section through the Karamea Gorge. 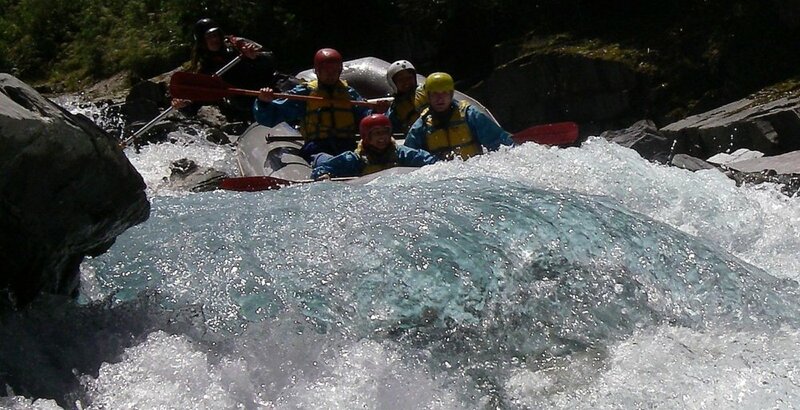 Rafting grade 4-5, this is what we call cerebral rafting – long boulder gardens and powerful water require great teamwork from guides and paddlers. Because of its remote location, the Karamea River is seldom rafted, and we are unlikely to see anybody else on the river. At the end of the day you have the option of flying by fixed wing aeroplane directly back to Nelson, or we can arrange for a rental car so you that can begin the superb drive down the South Island’s West Coast to the glaciers and Queenstown. You can delete this day if rafting is not your preference. 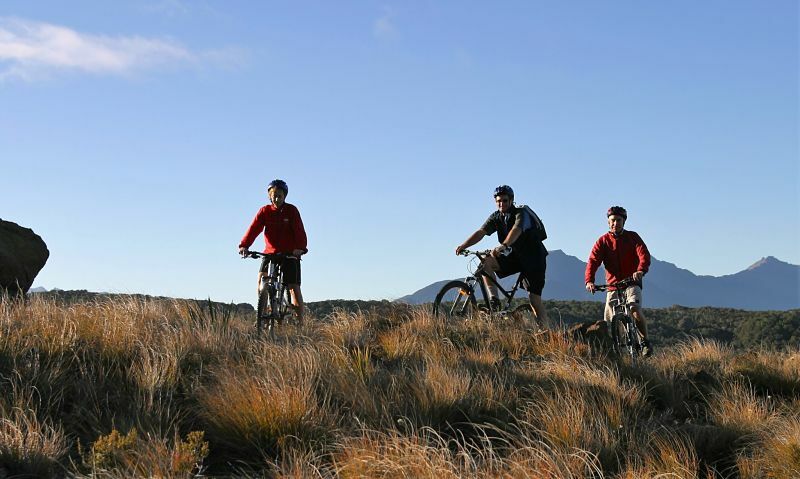 The trip can be adjusted to suit your fitness and inclination. Sections can be shortened, or for instance you can substitute the helibike for easy cycling on the Great Taste Trail. 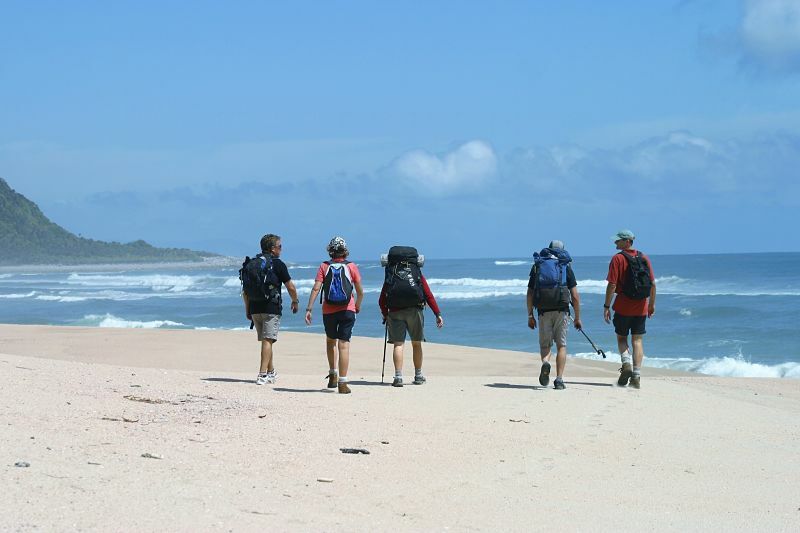 Because this is a private trip, the pace is up to you and your group. Individual sections can also be made harder or longer if that’s your preference. The trip is well within the reach of anybody with moderate fitness. How long does each section take? The helibike takes around 2-3 hours from the time we collect you to the time you reach the yacht marina. Sailing across Tasman Bay takes around 3 – 4 hours. The sea kayaking takes about 4 hours, and the helicopter trip is around 1 1/2 hours before you begin walking on the Heaphy Track. 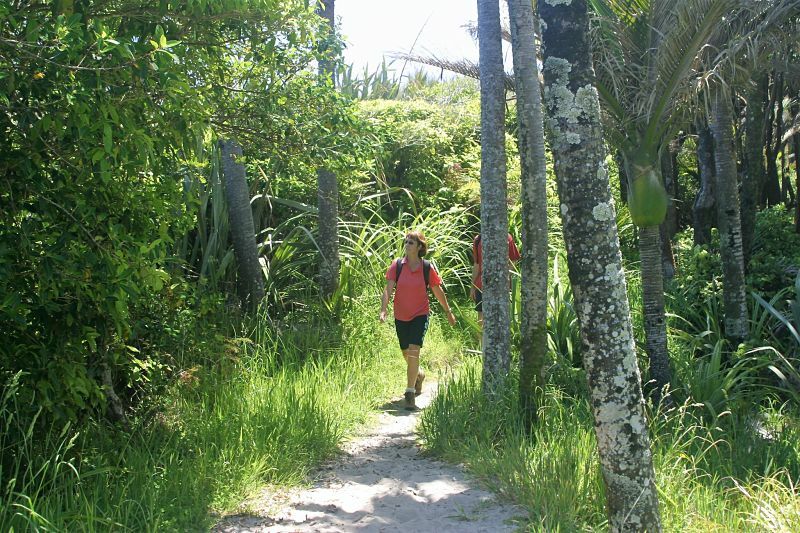 The walking section is 16 kilometres and takes around 5 – 6 hours. What happens if we have a family or group member who doesn’t wish to do each section (particularly the active sections) but wants to be part of the trip? 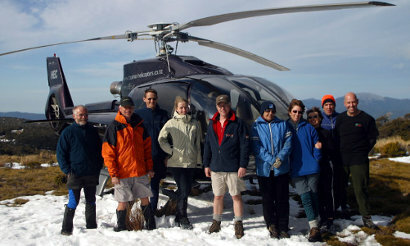 During the helibike, that member can enjoy the helicopter ride, and walk if they wish to the start of the ride, before flying back in the helicopter. 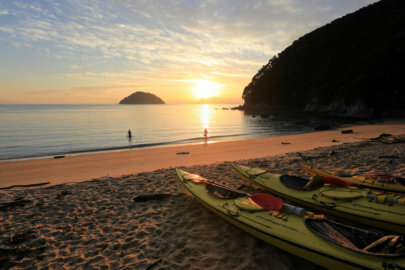 During the sea kayaking, that person can remain on the yacht, which will accompany the sea kayaking. On the Heaphy walking section that family member can enjoy the scenic helicopter trip, then be dropped at the Karamea accommodation by the helicopter along with the baggage. How long and how hard is the helihike? 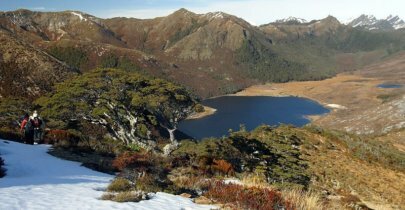 It’s around 19 kilometres (12 miles) and takes around 5 – 6 hours with stops for lunch. It is mostly gently undulating walking along the coastline with a steady climb over a small saddle at the end of the track . What grade is the rafting? It is mainly graded around 4 but depends very much on river flow. Two rapids are often 4. 5 to 5 and are portaged. We will sometimes change the sequence of the Journey to work around the weather, but we will consult you on both our judgement around safety and your comfort before we make final decisions onproceeding with any section of the trip. If a section is cancelled due to bad weather we will refund that portion of the trip. We have a family/group member with specific diet requirements. Can you accommodate this? We have our own chefs and prepare our all our own food. 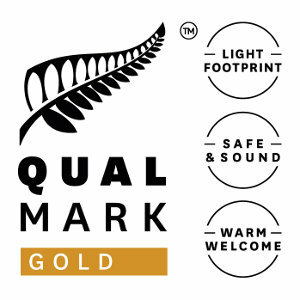 We can accommodate most dietary preferences with advance warning.